“Ga-lac-tic (g-lak’tik), adj. 1. Of or obtained from milk. Ten Years ago there was a sonic ripple (sort of near Katy…but not really) in the otherwise peaceful universe of Houston, Texas. A quartet of dashing young men took the stage claiming to be the Houston Astros. Unbeknownst to them, that name had already been taken. 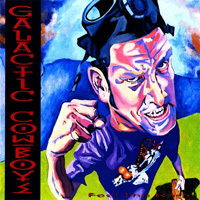 So, they settled for the logical “next best thing” the Galactic Cowboys. 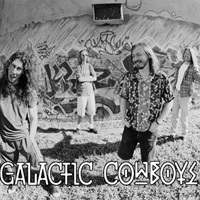 In 1990, they signed with DGC (Geffen) and released two critically acclaimed CD’s, Galactic Cowboys self-title (1991) , and Space In Your Face (1993). 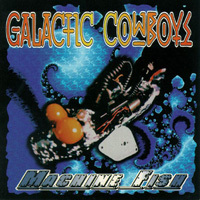 In 1995, the band moved to Metal Blade Records and recorded Machine Fish (1996) followed by the EP, Feel The Rage, also released in 1996 (which included covers by Paul McCartney’s Wings and Kiss). 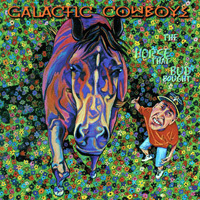 The Horse That Bud Bought (1997) followed these releases. 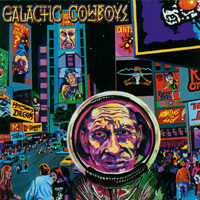 In the Spring of ’98 the Cowboys began recording again, which brings us to the new CD, At The End Of The Day. 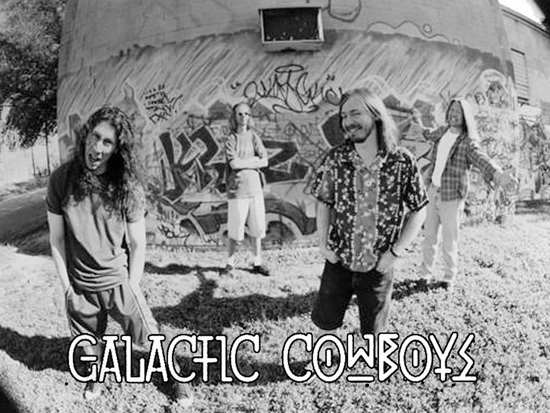 At The End Of The Day was recorded at Sunflower Studios, the Cowboys’ private studio in Houston, TX. It was produced, engineered, and mixed by drummer Alan Doss. Alan even sings lead vocal on one of his compositions… This is a first). It is a wonderful album, full of great sounds, cool changes, massive, gruntworthy riffs, and truly spectacular songwriting. It is by far their best work to date…a masterpiece. It is, of course, still chock full of their twisted marriage of blistering guitar hooks and “super-sugar-crisp-pop” songcraft… But this new CD has something extra special. Alan’s production has added an incredible sense of texture to the Cowboys’ sound. With the help of Wally Farkas’ well-stocked arsenal of vintage amps, stomp boxes, and guitars they were able to create a powerful, loud atmosphere for the songs to resonate alongside the adroit harmonies and ponderous lyrical content. The chords are dense and interesting, and in many ways it sound like they have infused this CD with everything that is great about the history of rock music… And yet, creating something very new… very modern. 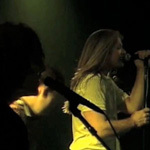 The first track, “Nothing To Say” written by Ben Huggins, has (like the entire CD) elements that are reminiscent of the Beatles, Ramones, Soundgarden, U2, Megadeth, and the Awful Truth. The second track, “Ants” is a n instantly accessible hit song. Monty Colvin did a marvelous job both singing and penning lyrics for this Farkas tune. (You really must listen to this song, or else you’ll never hear it) “At the end of the day you’ve got to be able to look yourself in the mirror and know that you have loved your neighbor…and treated him right.” With these words, you are launched into Colvin’s seven song medley, “The Machine Fish Suite”. It’s fun like a house of horrors at the carnival… This string of intricately woven, short ditties fits together to tell the tale of the band’s tumultuous history with the music industry. 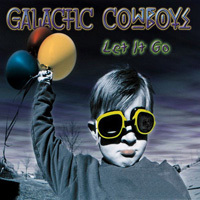 The Galactics were asked (no one ever calls them that…”Galactics”…Everyone always says, “The Cowboys”…kind of like when people say, “The Stones” for The Rolling Stones or “The Jam” for Pearl Jam) if the title of the new CD means that this will be the band’s final release. They said, “no”.